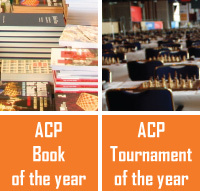 The Association of Chess Professionals has recently conducted a survey (composed of 4 questions) among Top 30 players in the world (as of 1 July 2012) about the time control in World Championships. Spring is with us and we already witnessed the first part of the exciting events this year – the Moscow Candidates tournament, won by the ACP Premium Member Sergey Karjakin. Congratulations! ACP continues to work at full capacity and we would like to remind and inform you of several important topics. 1 March is approaching fast and it is an important date for you and us. Curious why? Read on!